I was introduced to bushwalking/tramping/hiking as a young child in Boy Scouts and through my school physical/adventure education. After leaving school, I mainly did short daywalks until recently when I have started to again re-walk some of Tasmania's key hiking routes and try walks I have yet to attempt. I mainly walk in the winter months, in Tasmania's central highlands areas. I prefer light gear, extended walks (3-5 days) in a group of 3 or shorter walks (1-3 days) walking solo. I would generally carry a base weight pack of around 8 kg-10 kg (17 lb-22 lb). I am testing the 13 L model which arrived in a bright yellow colour. On their website, Sea to Summit also has a picture of a blue colour and lime green colour that are available. This new product from Sea to Summit is part of it's extensive range of stacks and bags. This model is fully welded dry bag that is constructed from 210D nylon with a TDU lamination on the outer surface to shed water and improve durability. Sea to Summit claims it is UV resistant and wont crack in extreme cold. It is a conventional roll-top design with the added feature of a 'Field Replacement Buckle and stainless steel pin'. The Dry Bag arrived nicely packed in a cardboard package that featured a picture of white water rafting. Whilst I imagine that water sports are a key target market for this product, I intend to test this (as I am a keen kayaker and sailor) in addition to the use for non-water sports such as backpacking and camping where I wish to keep items protected from water. Sea to Summit makes it clear on the packaging that this product that this bag is not designed to be submerged and that the performance of the bag (presumably at keeping the contents dry) depends on the correct use of roll-top closure. My experience in the past with products similar to this is that the available space inside the bag is limited by the amount of rolling of the top that is required to get a good tight seal. This is further increased as the thickness of the fabric increases. In this case I found the Sea to Summit bag to be quite thin but not so thin to cause me alarm about keys or similar puntcuring a hole if I were to store these inside. 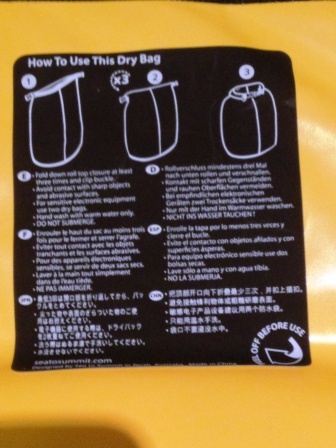 Given the additional warning on the label to protect the bag from abrasion and sharp objects during use, I suspect this bag is not intended to be strapped to the outside of a raft or kayak (despite the picture on the label) as this would damage the sack and compromise the waterproof outer. The instructions were located on a removable sticker at the top of the bag. Consistent with other bags, simply roll the top a few times (in this instance 3) and then clip the buckle together to seal and close. This bag has reinforcing at the top which makes it easy to roll and the clip slides together easily and feels firm when closed. I easily removed the sticker as I didn't feel I needed to retain it for future reference as this is a very easy to use product. I would not have any issues remembering the 3 folds as I would usually put at least 3 or 4 folds in a roll-top closure system. My first use of the bag was fairly straight forward. I was heading out for a twilight sailing race and figured I would use the bag to store my thin jacket, wallet, keys, glasses and a spare hat. In my view, 13 L is on the smaller side for dry bags so I was a little worried I would not fit as much in this bag as I would like. In this case all of the above items fitt without any issues. This bag features an oval shaped base, this made it easy to pack stuff inside as I could sit the bag on a table and it would remain upright. I also found the bright yellow colour was actually quite handy when I needed to qucikly change glasses during the race, I could locate my bag easily as it was nice and bright! Overall my initial impressions of the Sea to Summit Dry Bag are good. I own a lot of their products and have always found them to be excellent in terms of design and usability and durability, and this product appears to be consistent with my previous experiences. I plan to test this bag over the next few months, which will see me out sailing twice a week, a few kayak sessions in there and some camping and hiking. The results of my Field Testing will be posted in the coming months. My thanks to Sea to Summit and BackpackGearTest.org for the opportunity to test this product. During my testing of the Sea to Summit Dry Bag, I used it for various activates including camping, day hiking, sailing and kayaking. I estimate I have used the dry bag around 2-3 times a week every week during the testing period. My camping trip was during the new years holidays, based by the beach on the east coast of Tasmania for 4 days. During this trip there was no rain with temperatures ranging from around 30 C (86 F) to around 14 C (57 F). Winds were generally lite with bright sunshine. From our base we undertook daywalks in the near by Douglas Apsley National Park. I also used the dry bag as a liner for my day pack when walking from home to work (8km/5 mi) or when undertaking day walks around the Mt Wellington Park, near my home. During all of these trips I would generally pack a water bottle, a lightweight outer jacket and some basic snack food for myself and my 2 year old son. I also used the dry bag extensively during the summer when sailing or kayaking. This means I used the bag at least once a week to protect my gear from water. 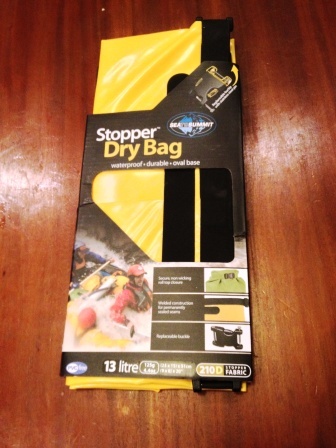 I have found the dry bag to be a strong, durable and reliable way of protecting my gear from water. Not once during the testing period did I experience my gear becoming damp or wet. I was particularly impressed to discover my phone and wallet were perfectly dry despite me leaving the dry bag sitting in a pool of water under the deck of my kayak. When day walking I would use the dry bag as a liner for my 20 L day pack. As the dry bag is 13 L it was a good fit inside my pack, however the roll top did take up a little extra space but this was no issue. I would generally use the dry bag to put some clothes in or my phone, in case my water bottle leaked inside my pack. This approach worked well. Overall this bag has proved both reliable and strong. Despite being thrown around on the deck of a boat, stuffed inside my day pack and generally not treated with gentle hands, the dry bag still looks basically like new. There is no obvious signs of wear or tear and all the glued seams look solid and show no signs of coming apart. The buckle closure still feels tight and secure and has never failed. I have never had water enter the bag and it doesn't look likely to happen in the near future. 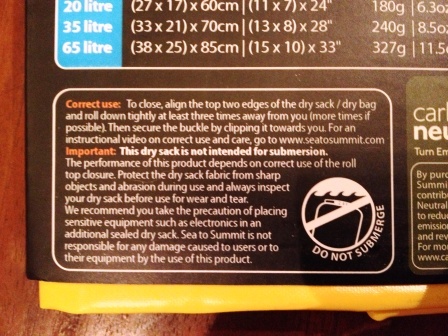 My final comment regarding the Sea to Summit dry bag is simple. Don't get one, get several! I will definitely look to grab the largest size to complement the 13 L bag I have been testing and use the 2 of them as my main strategy for protecting gear I want dry in wet conditions. This concluded my testing of the Sea to Summit dry bag. Thanks to Sea to Summit and www.BackpackGearTest.org for the opportunity to test this great product.